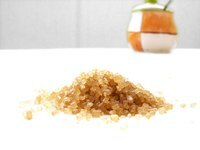 Brown sugar crystals contain molasses, which gives it a more robust flavor than white sugar as well as a soft, almost damp texture. Because of the differences between the two, white sugar is not a suitable substitute for brown. If you find yourself lacking brown sugar called for in a recipe, though, you can add molasses to white sugar for a decent substitute. The amounts you will need of each ingredient depend on whether you want light or dark brown sugar. Measure 1/2 cup of white sugar into a bowl for each 1/2 cup of light brown sugar you want to substitute. If you need 2 cups of brown sugar, for example, measure 2 cups of white sugar into the bowl. Pour 1 tbsp. of molasses onto the sugar in the bowl for each 1/2 cup of light brown sugar you want to substitute. For instance, if you need 2 cups of brown sugar, measure 4 tbsp. of molasses into the bowl. Mash and stir the combination in the bowl until well-blended. Use immediately or store in a sealed container for later use. Measure 1/2 cup of white sugar into a bowl for each 1/2 cup of dark brown sugar you want to substitute. If you need 2 cups of brown sugar, for example, measure 2 cups of white sugar into the bowl. Pour 2 tbsp. of molasses onto the sugar in the bowl for each 1/2 cup of dark brown sugar you want to substitute. For instance, if you need 2 cups of brown sugar, measure 8 tbsp. of molasses into the bowl. If you have dark brown sugar but need light brown sugar, mix equal parts white sugar and brown sugar. To make light brown sugar into dark, add a 1 tbsp. of molasses per 1 cup of light brown sugar.